WASHINGTON – Arizona and the Environmental Protection Agency are talking on ways the state can meet tough new federal goals for power-plant emissions, but one state official wonders how much the federal agency is hearing. Arizona Department of Environmental Quality Director Henry Darwin told a House subcommittee Tuesday that he welcomes the EPA’s willingness to talk about the Clean Power Plan, which calls on the state to cut its carbon emissions by 52 percent by 2030. But he said the federal agency has not committed to any changes or concessions. 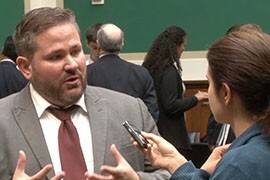 “We’ve definitely been talking to EPA about what our concerns are, but they haven’t been real committal about what they’re going to do in response to our concerns,” Darwin said after a hearing before House Energy and Commerce subcommittee. In an email Tuesday, the EPA said it is “continuing to engage with a broad variety of stakeholders – including states – to help inform the final rule” for the Clean Power Plan. It said EPA staff has responded to hundreds of letters, held multiple Q&A sessions and plans more hearings and webinars in the future. No EPA officials were called to Tuesday’s hearing, where Darwin and environmental officials from five other states – Texas, Montana, Indiana, Maryland and Washington – testified about how they are dealing with the Clean Power Plan. Maryland and Washington officials said they expect few problems complying with the plan, which set different carbon-reduction goals for each state. Washington faces the largest percentage cut, being called on to reduce carbon emissions by 72 percent by 2030. But officials from the other states complained about the EPA’s “cookie-cutter approach” to rule-setting, and said the agency had not reached out to them before unveiling the rule on June 2. States have until Oct. 16 to respond to the EPA, which will then spend the better part of the next year finalizing the plan. When asked by Rep. Ed Whitfield, R-Ky., if they would like an extension of that deadline, four of the six witnesses, including Darwin, indicated they would. According to the EPA’s website, the Clean Power Plan’s final goal is to reduce carbon pollution 30 percent nationwide by 2030, setting specific goals for each state’s contribution. Darwin said he worries that this may be the state’s best chance to get changes in the plan, which calls on Arizona to achieve the second-highest reduction goal, after only Washington. “Once the rule is final, then it really shuts a lot of doors in having ongoing conversations with EPA,” he said. While he welcomed the discussions with EPA, Darwin joined lawmakers on the panel who expressed concerns that the plan’s goals are unrealistic, inflexible and potentially illegal. Darwin indicated as much at the beginning of his testimony, claiming the EPA does not have “the authority to regulate greenhouse gases as it proposes to do” in the Clean Power Plan. The EPA in its email insisted it has “clear, settled legal authority under the Clean Air Act to issue regulations for greenhouse-gas pollution from power plants,” citing two Supreme Court Cases it says gives them authority on the issue. But Darwin said legal action against EPA remains a possibility for the state, depending on the outcome of discussions. He also pointed to another potential snag: HB 2442, a state law from 2010 that prohibits state agencies from regulating greenhouse-gas emissions without approval from the Legislature. The Legislature has not been in session since the Clean Power Plan was released and while Darwin said he has spoken with some lawmakers on the issue he has not received any official word on the topic. “We’ll see when they go to session,” said Darwin, who said there is “a lot of interest” from lawmakers in the issue. Arizona Department of Environmental Quality Director Henry Darwin told a congressional panel that the state has concerns about new federal carbon-emissions rules, but that the EPA and state are talking about the issue. Cronkite News' Stephen Hicks reports.